SCR HEATIME is a unique, innovative and autonomous health monitoring tool, which carries real-time information about nutrition and animal welfare. Automated detection of oestrus helps to increase the pregnancy rate, eliminating the need for visual monitoring of the animals and eliminating the guesswork. It is possible to reduce the time and the need for specialized labor, to reduce the interval of calving, while minimizing the reliance on excess use of hormonal compositions in the control of reproduction. Additionally, collapsed birth interval – capture, enhanced the rate of genetic improvement of livestock, leading to production of more milk cow’s lifetime. Rumination is a direct indication of the health and wellbeing of the cow. Breeders and nutritionists use regurgitating as crucial illustration of the health of dairy cows. The rate of rumen must be checked regularly for early detection of disease. Early drawing treatment reduces the duration of the disease and by limiting the required treatment. – Displays time and accurately the effectiveness of the diet or change in diet. – Detects Early Stage health problems, allowing application deterrent / preventive actions. – Closely monitor the animal health risk periods. – Evaluates the restoration of cows immediately after calving. Maximizing return on investment through the ability of the system to process and utilize large volume and variety of data. Efficient upgrade starting from the interface on the touch screen to the PC-based SCR Heatime Pro System. Use existing tags for more strengthened and centralized management of health and reproduction. He extended the system as the herd grows and needs change. Optional upgrade kits allow easy incorporation of new features such as a highly efficient registration system, individual identification package for armektirio, diefryntes variance and more. Advanced communication features for the effective management of tags. The two-way wireless communication to and from tags, enables remote update and upgrade, facilitates maintenance and protects the investment. 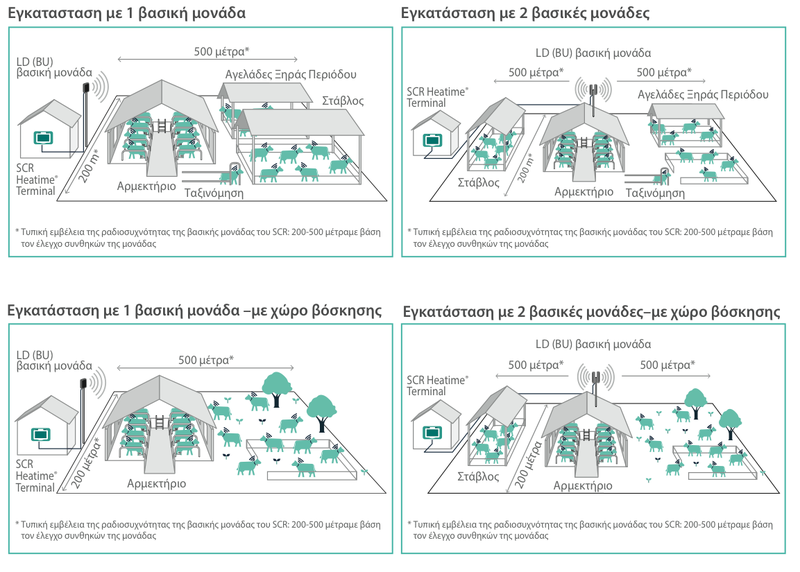 Below you can see examples of installation, which can be adjusted depending on the conditions prevailing in farming. With SCR HealthyCow24, thanks to Wi-Fi and the 3G connection you can watch remote mobile and tablet health and breeding of cows and have immediate access to information and data.